This chapter looks ahead to the year 2030 and considers the ways in which current visions of massive open online courses may develop into realities. In order to do this, it considers the changes in pedagogy, technology, and the wider environment that will be necessary in order for them to flourish. 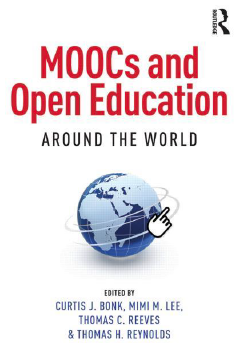 The chapter argues that, by 2030, the systems that develop from MOOCs will be meeting the needs of societies by educating millions of digital citizens worldwide. These systems will have opened up access to education and be enabling people from all over the world to enjoy the benefits of learning at scale. In order for this to happen, MOOC providers, policy makers, and educators will all need to proceed with this vision in mind. In effect, if MOOCs are to make a difference and truly open up education while enhancing learning, the pedagogies in place by 2030 must take into account entirely new groups of learners as well as vastly new roles that will emerge for educators. Such pedagogical approaches must also utilize innovative approaches to the design of that learning, whether it be MOOCs or some other form of learning delivery at scale. This entry was posted on July 11, 2015, 8:22 am and is filed under Chapters, Educational Futures, MOOCs, Open online learning, Publications. You can follow any responses to this entry through RSS 2.0. You can leave a response, or trackback from your own site.